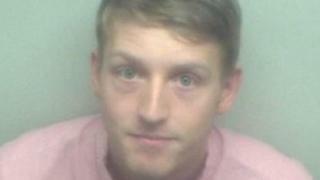 A driver who caused the death of a woman in a crash has been jailed for two years. The 56-year-old victim was a passenger in a car that was hit by Ian Harvey's car in Higham, Kent, in December 2015. She died at the scene, in Lower Road, and two men and another woman were hurt. Harvey, 24, of Burdett Avenue, Shorne, admitted causing death by careless or inconsiderate driving at an earlier Maidstone Crown Court hearing. As well as being jailed, the defendant was disqualified from driving for three years. The court heard how he lost control of his Ford Fiesta while negotiating a left-hand bend after overtaking another car at excess speed. PC Guy Ditcher, of Kent Police, said Harvey "chose to ignore the hazards around him" while driving well over the speed limit on a narrow, unlit road at 20:30 GMT. "An entirely innocent and well-loved woman has needlessly lost her life because of these reckless actions," he said.